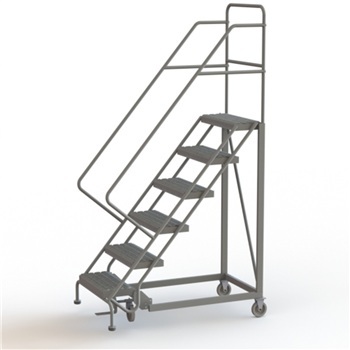 Designed with a reduced and more gentle 50º incline that permits the user to descend face forward for added safety and stability when carrying loads. Standard 16" wide steps for narrow aisles and tight spaces. 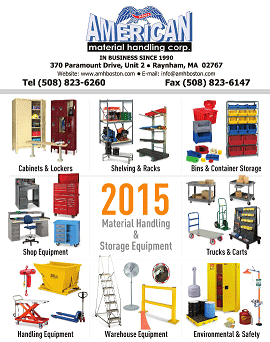 All models comply with OSHA 1910.29 & ANSI A14.7. NOTE: This ladder ships knocked down. Assembly required. Construction - 1-1/16" Tubular steel. Handrails. Stair stringer constructed of 1" square tube for added strength and durability. Reinforced 2" x 1" rectangle tube bottom frame assembly for added strength. Non marking wheels. Steps - First step actuated locking system on all sizes. Top Step Depth - 17"
Finish - Powder coated gray. KDEC103162 3 16" 30" 41" x 23" x 62"
KDEC104162 4 16" 40" 49" x 23" x 72"
KDEC105162 5 16" 50" 58" x 23" x 82"
KDEC106162 6 16" 60" 66" x 27" x 92"
KDEC107162 7 16" 70" 74" x 27" x 102"